Executive producer: V. J. Shah; producer: Mehboob Khan; screenplay: Vajahat Mirza, S. Ali Raza; photography: Faradoon A. Irani; editor: Shamsudin Kadri; sound: Kaushik; art director: V. H. Palnitkar; dance director: Chiman Seth; costumes: Fazaldin; music: Naushad; lyrics: Shakeel Badayuni. Cast: Nargis ( Radha ); Sunil Dutt ( Birjoo ); Rajendra Kumar ( Ramoo ); Raaj Kumar ( Shamoo ); Kumkum ( Champa ); Chanchal ( Roop ); Kanhaiyalal ( Sukhi Lala ); Jiloo Maa ( Sunder Chachi ); Azra ( Chandre ); Master Saiid ( Birjoo, the boy ); Muqri ( Shambu ); Sheela Nayak ( Kamla ); Siddiqui ( Dalita Prasad ); Geeta ( Village girl ); Master Surendra ( Ramoo, the boy ). Barnouw, Erik, and S. Krishnaswamy, Indian Film , New York, 1965. Jha, B., editor, Indian Motion Picture Almanac , 10th edition, Calcutta, 1975. Rangoonwala, F., Pictorial History of Indian Cinema , Calcutta, 1979. Pfleiderer, Beatrix, and Lothar Lutze, The Hindi Film: Agent and Re-Agent of Cultural Change , New Delhi, 1985. Ramachandran, T. M., 70 Years of Indian Cinema (1913–1983) , Bombay, 1985. Armes, Roy, Third World Filmmaking and the West , Berkeley, 1987. Variety (New York), 27 August 1957. Kine Weekly (London), 16 February 1961. City Limits (London), 18 June 1982. Haffner, P., "Le Cinéma indien en Afrique noire," in Filméchange (Paris), Winter 1983. Thomas, R., "Indian Cinema: Pleasures and Popularity," in Screen (London), May-August 1985. Thomas, R., "Sanctity and Scandal," in Quarterly Review of Film and Video (New York), no. 3, 1989. Mother India , one of the all-time hits of the Hindi commercial cinema, has also been a noted success in the Hindi film's traditional export markets in the Middle East and Africa. It is one of the few such films to have received exposure in Western cinemas, and even won an Oscar nomination for Best Foreign Film. The film is very much a legendary enterprise, and one conceived perhaps on such terms. It was the last major success of the director, Mehboob Khan; it is one of the best remembered works of the music director, Naushad; it represented the last major appearance of the female lead, Nargis; and it was a remake of an earlier Mehboob film, and one of the most acclaimed of the 1940s, Aurat ( Woman , 1940). In this sense, it encapsulates a number of filmic and non-filmic narratives into its own, and weaves these together into a mythical shape. Mehboob's own story is perhaps the central one underlying Mother India: born in a poor rural family, he rose through menial jobs and minor acting roles in the studios of the 1930s to become a director in 1934. In Hindi movie parlance he was associated with the genre of the "social" film—melodramatic narratives oriented to exposing social malaise. His better-known films emphasized a kind of populism about the "people's" travails. The "people" are presented as the true, the genuine India, remaining faithful to their traditions even as they accept a modernizing, reformist context. Mehboob's personal history was publicized to lend authenticity to Mother India' s tale of rural folk punished by the elements and struggling under the burden of debt. However, the film is very much an essay in exoticising the "simple" life. Colour—a relatively recent and still uncharacteristic phenomenon at the time of the film's making—is used to make a spectacle of nature, with the narrative and song sequences splashed in dawns and sunsets. As with later sagas of the rural life (such as Ganga Jamuna , Nitin Bose, 1961), communal activities, whether of tilling and reaping or in a celebration at festivals such as Holi (the spring festival), are staged in a highly choreographed style. The music director, Naushad, made a conscious attempt to bring folk rhythms into the repertoire of Hindi film music. But the stylized evocation, with its ornamentalization through spectacle, places the music too in a mythicizing distance from the "folk." The real object of the myth is not the folk but the modern nation. The original 1940 narrative dealt with the sufferings of a peasant woman, Radha, abandoned by her husband and left to fend for her sons. Drought and debt beat down on her. The focus is on the value she places on her chastity even in the face of starvation, and on the great love with which she sustains her children. These qualities carry her family, and by extension, the village community, through the crisis. However, the nurturing mother has her negative side. An excess of love causes her to turn a blind eye to her undisciplined, hedonist son, Birjoo. This indulgence leads him into bad ways; he becomes a bandit and a threat to the community. Ultimately, the mother has to kill him, and dies, broken-hearted. In the later film, there are a number of important changes. The issue of exploitation, which was present but marginalized in Aurat , is now quite central. There is an induction of nationalist discourses about whether violence or faith in God (a complete distortion of Gandhi's much more active notion of passive resistance) are to be embraced in the face of injustice. These oppositions are quite deviously solved. Birjoo, the bandit son, is now clearly a social bandit, directing his activities against the oppressive money-lending classes. But his actions are tainted; he not only kills the exploiting moneylender, he also abducts his daughter. A woman's honour—the mechanism whereby the patriarchal authority of the community at large is maintained—is threatened, and so Radhu kills her son. Thus while exploitation, presented as the impediment to the progress of the rural community, is ended, the significance of Birjoo's actions is denied. Faith and honour triumph; development, in keeping with contemporary governmental designs for the rural community, is achieved in the construction of a dam. The mother, still grief-stricken over Birjoo's death, inaugurates it as mother of the community. But the film's work of ideological denial is unbalanced when, in Radha's perception, it seems to be Birjoo's blood which flows out when the dam is opened. 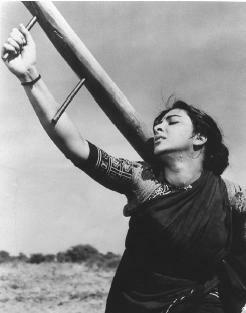 Mother India is then not only the re-working of an earlier film. It is a narrativization of a certain legacy (that of the national movement) with the object of presenting certain contemporary problems of inequality, justice, and development, in an ideological way. Seeking to represent the rural people, the film actually makes of them elements in a design of colour, song, and dance, an ornate spectacle conceived to reflect the populist myths of the modern state.